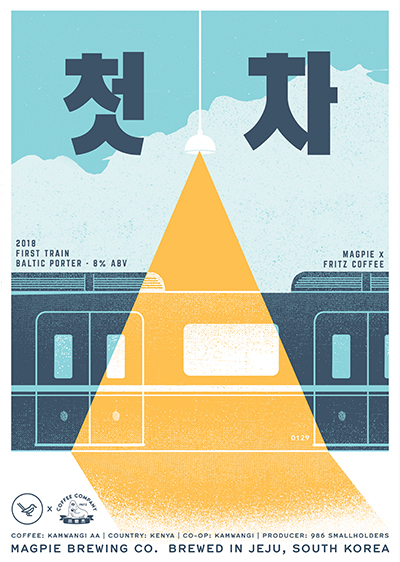 First Train 2018 — Magpie Brewing Co.
발틱포터 막차의 모닝커피 버전. 매년 ‘프릳츠 커피’와의 콜라보레이션으로 만들어지며 이번엔 싱글오리진 캄왕기AA 원두가 배치당 15kg 이상 첨가됨. 강하게 로스팅 된 커피맛이 다크 몰트, 다크 초콜릿, 블랙 커런트, 체리 등 발틱포터의 진한 풍미와 완벽하게 어우러짐. 커피팬 맥주팬 모두를 위한 선물! The First Train is the breakfast version of our Last Train Baltic porter. Every year we collaborate with Fritz Coffee and together select a new special bean to wed to this dark, smooth lagered ale. This year we chose Kamwangi AA, a single-origin co-op coffee grown by 986 Kenyan smallholders. The dark roasted coffee adds rich notes of fig, raisins and chocolate and balances the deep roasted character of our Baltic porter with a slightly acidic caramel toffee finish.